Developed by Malcolm and Duncan Campbell on the beaches of Oxnard, CA in the early 1970’s, the bonzer surfboard was one of the first to incorporate three fins. Specifically, twin keel-shaped side fins placed forward of a standard center fin. 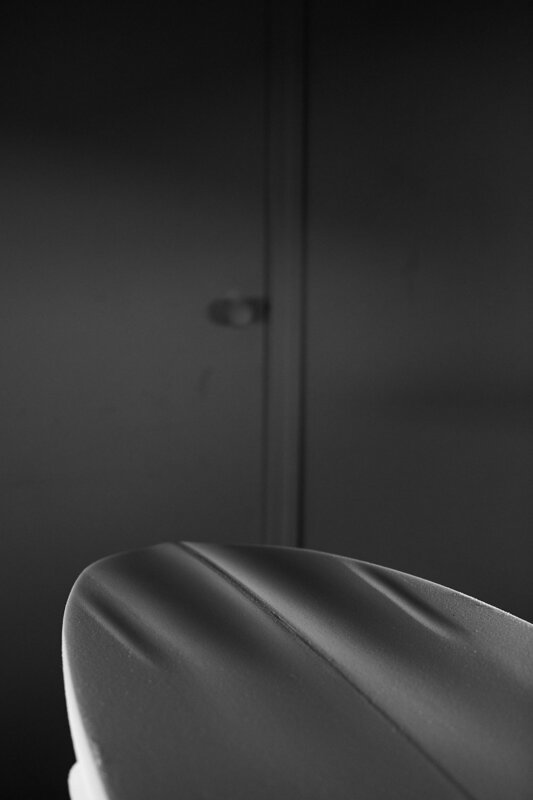 When added to their single to double concave design, it created both speed and maneuverability never before seen from the standard single-fin boards of the time. Thus, the bonzer became what many consider as the first high performance three-fin surfboard. Today, Jacob Campbell (Malcolm’s son) continues the brothers' shaping legacy on the North Shore of Hawaii. He's been pumping out bonzers for the local surf community, including Mikala Jones and Tamayo Perry, and stocks a selection at Cafe Haleiwa (owned by Duncan). In addition to a good meal, you can take a walk down memory lane and check out some reproductions of the first boards that Malcolm and Duncan shaped back in CA. Cool factor: the original center fin from their first board is glassed on to one of the replicas. 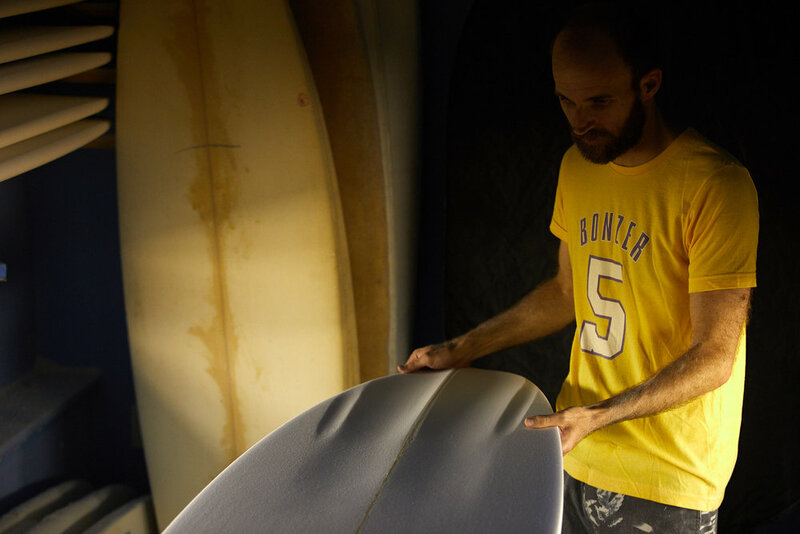 We had a chance to ask Jacob a few questions about his upbringing, the bonzer movement on the North Shore, and how he's incorporated his personal style and point of view into the board building process. Needless to say, we're excited to see where the bonzer journey will take us under this next Campbell generation. SM: Can you tell me about your path to becoming a shaper? JC: I would describe getting into shaping as a slow yet natural process, with my dad never pushing me towards doing it. Growing up with him often covered in foam dust in the shaping room out back, he had us chipping away on our own boards on occasion. But he also allowed and encouraged the space for my siblings and I to pursue our individual interests. For me, that lead to getting a degree in fine art and cultivating a sense of creativity well outside surfing. However there did always remain a certain gravity pulling me back toward bonzers, and over time after college I found myself doing more shaping. I think because of the time and space I was afforded, I was given the chance to come to it on my own terms, with a clearer perspective on the hows and whys. Shaping wise, everything I've learned and continue to learn is from my dad, either by watching him in the bay explaining different processes or by having him feel and critique boards I've done. He's a perfectionist for sure, so you're definitely under the microscope any time he sights a board. Duncan's influence has been that of attitude, approach, and knowledge when talking about the boards. Of the two of them, he's much more of the evangelist, we like to call him the bonzer oracle. His energy and tenacity have been integral to getting people on bonzers and raising the boards' profile over the years. 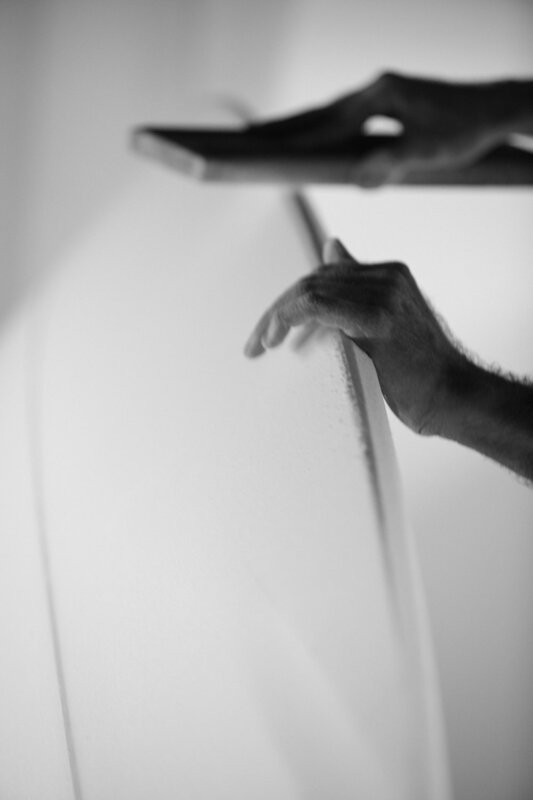 SM: What was the inspiration behind bringing the bonzer shaping experience to Hawaii? JC: Between the waves themselves and the quality of surfing that happens here, Hawaii remains a real epicenter of surf culture. That alone is plenty inspiration to try and have bonzers in the mix, especially on the North Shore. 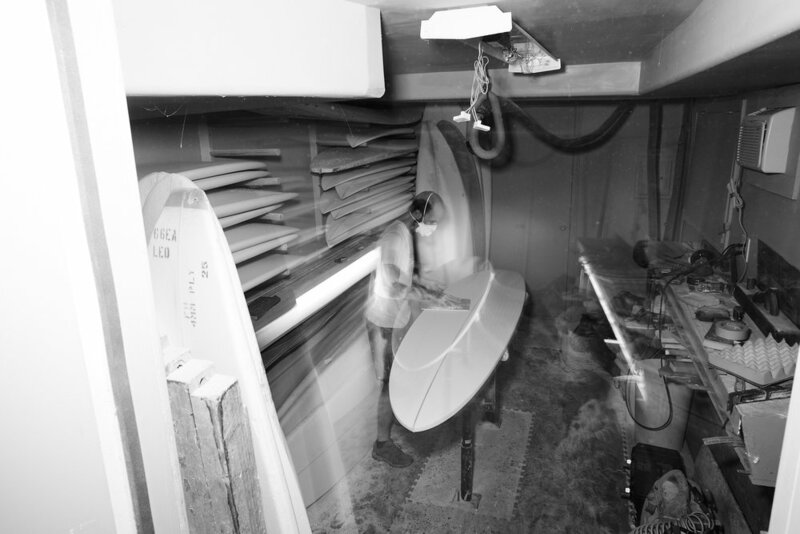 After moving to Oahu in 2012, I began working at the Bonzer Front, which my cousin Megan started with Duncan and eventually evolved into a beer and wine store, but with surfboards! Working there for a couple years, I got to meet a lot folks from the community and through people's continued interest in the boards I saw an opportunity to shape more and make them directly on island. There's a whole long history too of bonzers being pushed here at critical levels, so it's exciting to put the work in and try and contribute to that. SM: Have you incorporated different shaping variations to the bonzer design for the types of waves in Hawaii vs. CA? JC: We've done a little bit of refinements within different models and for customers. Since the bonzer system translates so well in the waves out here, these adjustments are mostly small tweaks. Usually it's bumping up tail rockers slightly for certain boards, and pulling in the nose or tail to help them fit better into tighter/faster pockets. Nothing too heady. Also, because there's generally so much more energy and power in Hawaii compared to CA, the water feels less neutral. With the right timing it can provide a surfer with a bit more automatic thrust and momentum, which means sometimes they can get away with having a little less volume under them, within reason. SM: The collaboration with Channel Islands seems like it’s been well received. Are you planning any further collaborations in Hawaii? JC: Nothing planned as yet, but I would be open to it. Actually, I shape a bit out of Daniel Jones' room at Rocky Point and get to see a lot of the boards he does which look great and go really well. Talk about an ace test pilot. I've not mentioned it to him, but have been thinking it'd be fun to try and knock something out together. If you're reading this, Daniel...! SM: I read that you are also an artist. What is your favorite medium? How have you incorporated your art into your boards? JC: I trained and studied mostly in traditional mediums: pencil, charcoal, and acrylics, which remain favorite materials to use. For surfboards, on occasion I'll do custom or original artwork, painting with brush directly onto the boards and sometimes acrylic pens on the glass—that's something I could and should do more of because it flexes another part of the brain and also is just plain fun. 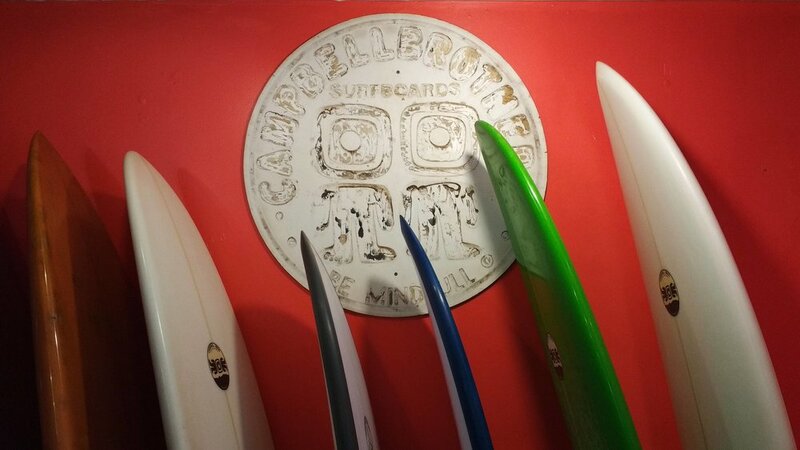 SM: What would you like people to know about Campbell Brothers Surfboards, and what’s to come in the future from your label in Hawaii? JC: Speaking a little for my dad and Duncan here, I guess we'd just like people to know the appreciation shared for the ongoing interest in and respect for the boards. For decades on end, it was never a given their design would stick around and be accepted on the level it is today. So for the two of them this really has been a lifetime pursuit, like some type of a case study in pure commitment and attrition. They like to say there's no separation between themselves and the boards, and I can tell you there truly isn't. To see the continued stoke from people from all walks of life experiencing bonzers, it still means a heck of a lot. For myself in Hawaii, my goal is to continue to hone my skills as a shaper and do my best to live up to and elaborate on their legacy. As for what's to come, all I can say is more boards, more art.